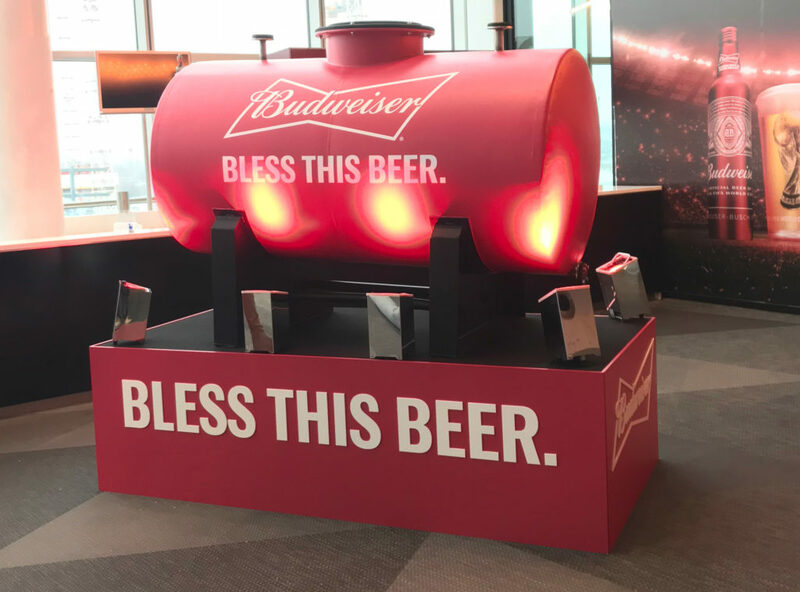 Helping Budweiser to "Bless this Beer" at the World Cup - On Event Production Co. Creating a custom-branded tank to hold the grain which Budweiser will use to create a special beer for this summer’s World Cup was a challenge we accepted recently. Working with our good friends at Frukt, we were asked to source and create a special Budweiser-branded vessel for the launch of the brewing giant’s ‘Bless this Beer’ campaign. The beer-maker is an official sponsor of this summer’s football extravaganza, in Russia. It plans to create a special limited-edition beer, a bottle of which will be sprinkled on the pitch – to ‘bless’ it – at the opening game between the hosts and Saudi Arabia. We were asked to create a vat containing the grain that will be used to brew the beer, which would be signed by key Budweiser employees at a special event, before being shipped off to the brewery. It proved quite a challenge……We scoured the country looking for old brewing tanks and other equipment, but to no avail. However, after much searching, we managed to find a rusty old toothpaste container, which we managed to clean-up inside and out, build a custom still for and brand it in Budweiser’s famous red and white colours and iconic logo, all in time for the launch event. Anabelle Parslow, our Fabrication Project Manager, said: “It was a real challenge to source a tank which fit the bill and then get it back into a usable condition, so we’re really pleased with the end result. “The tank is on-brand and looks absolutely amazing. “It’s bizarre to think that the grain we put in it will be used to brew a batch of limited edition beer that will be used to launch the World Cup later this year.